The preparation of this recipe has definitely had a surprising ending which I am proud of. I haven´t invented anything new but little by little, my original idea of a simple dressing became another thing, just by pure intuition. And I feel proud of it, of my capacity to trust myself more and more every time. We feel our confidence growing when we value our own qualities, strengthen them and congratulate ourselves for them. It can be something as simple and easy as the mayonnaise recipe of this post, but is apparent simplicity doesn’t take away its value. I didn´t know what the result was gonna be but I trusted myself and got started, and without trying too hard it came out something I feel proud of, something whose texture and taste filled me with pride. I didn´t expect anyone to sing my praises but I was kissing myself all along. When the outcome of a recipe with so few ingredients is so perfect, I am even more passionate about my profession. I have an innate tendency to complicate things, which is why elaborating easy things is an enormous challenge for me. And that challenge has been far exceeded with today´s mayonnaise. It has an amazing texture, so smooth that it is an authentic wonder. It can accompany any type of salad, be used as a dip or even inside a good sandwich. And the best thing is that it has very little oil if we compare it with the traditional mayonnaise as most of the recipe´s fat comes from the avocado. And now it is moment to start my “praise for the avocado”. Sometimes I ask myself which ingredients I couldn´t live without, and definitely, the avocado is one of them. 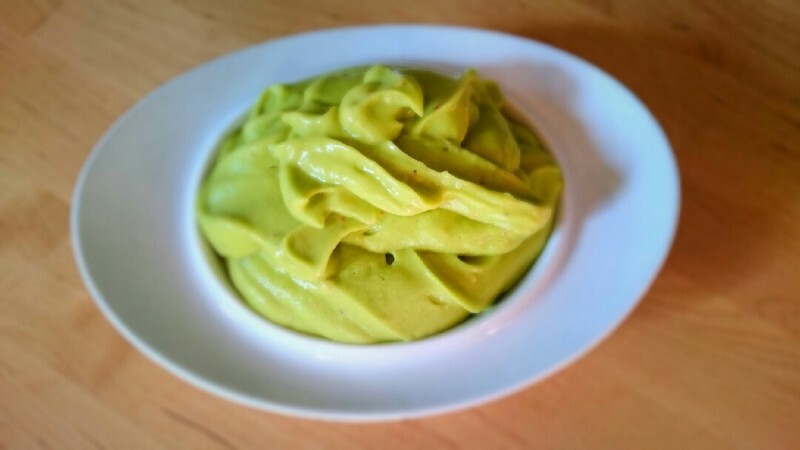 It can be eaten alone, in a dressing, as part of a cream, in sweet or salty recipes, I have even tried fried avocado…I am passionate about the avocado because of its simple taste similar to nuts and its texture. My favourite classic when I don´t have anything for dinner or I don´t feel like cooking is the following: avocado spread over an spelt toast with a drop of oil and salt: it is HEAVEN. And it is also healthy! You can´t ask for anything else! Its fat is very beneficial: regulates the hormones, helps in the digestion, gives us energy and helps us to have a perfect hair and skin. It is a SUPERFOOD (term so fashionable nowadays) which also provides iron and copper, favoring the regeneration of the cells in the blood and preventing the anemia. And seriously, don´t be afraid of the fat, THE FAT IS NECESSARY FOR OUR BODY!!! In an hormonal, cerebral and muscular level, among many others, and also as an essential element to absorb specific vitamins that are soluble in fatty media such as the vitamin A, D (very important! ), E and K. But be careful! good fats, so prepare yourself to say goodbye to the margarines or hydrogenated and refined fats and say also goodbye to the light products, which are just marketing and generally have more sugar than the non-light ones. Say yes to the avocados, olives (better if they are not in vinegar), coconut, coconut oil or olive oil (always better cold pressed), seeds and nuts and even if you don´t believe me, you should say yes to the butter (or ghee that we use to cook). If you can find it raw, even better, and always with organic origin. They all can be consumed with moderation. In Spain we are right now in the season for the avocados so you won´t find any excuse not to use it as a basic ingredient in your kitchen. It is also one of those fruits that appears in the list of fruits with less pesticides, so it doesn’t matter too much if you don´t buy them organic all the time, provided that you consume them. 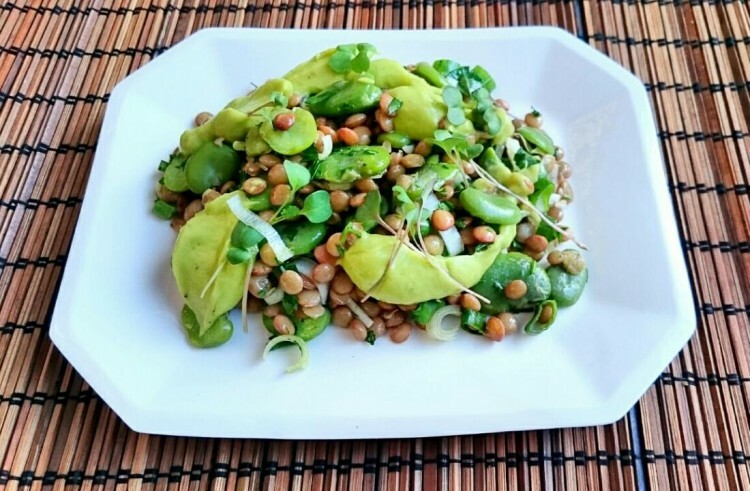 To finish, say that this salad´s recipe is just an idea, so feel free to change the broad beans for peas or green beans (which are in season as well!) or for whatever vegetable you like most. 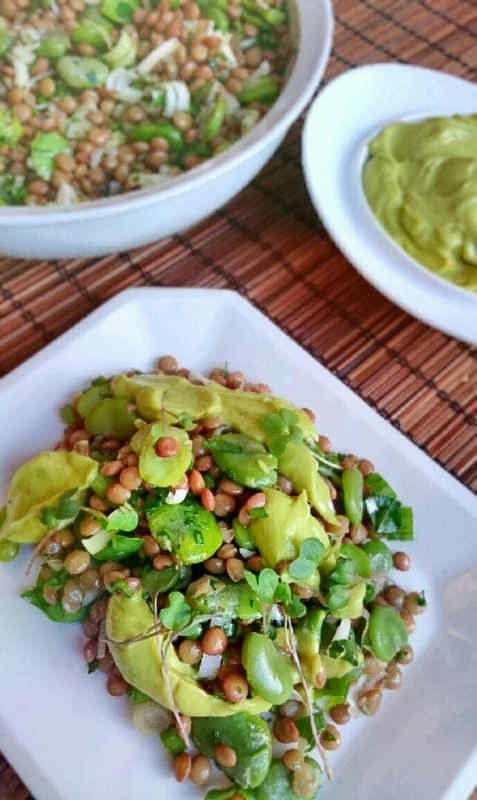 This type of legume salads symbolizes for me the start of the hot season and the beginning of the summer, when the food becomes more refreshing and light. Boil the lentils in enough water with a branch of laurel. Throw 1 tablespoon of salt 5 minutes before straining them. Let them cool. Boil the small broad beans you took out from the pods during 3 or 4 minutes depending on its thickness. Strain them and cool them down under cold water. Remove the peel that covers them. Set them aside. Chop the scallion and the parsley and put them in a big bowl. 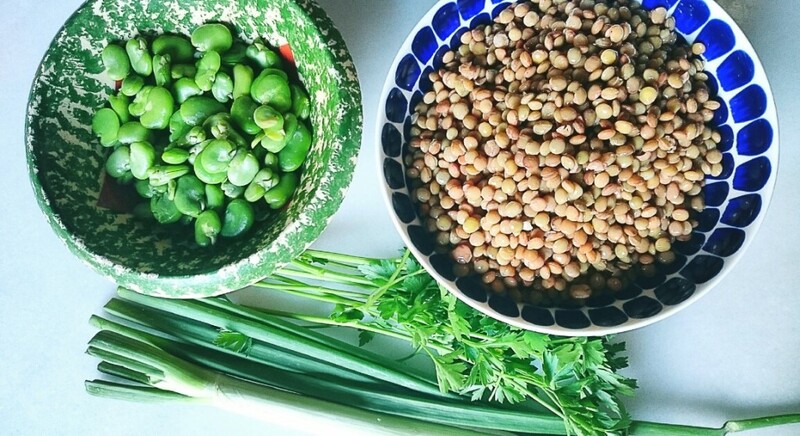 Add the lentils, the small broad beans, the oil and the salt. For the mayonnaise, mix the avocados in a food processor with the rest of the ingredients, except the oil, until you get a creamy consistency. Add the oil little by little if you find some space to add it while the machine is spinning, or add it in three different times, crushing everything well every time. Put the mayonnaise in a bowl and accompany with the salad.